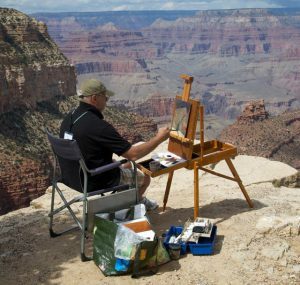 Thirty of the most celebrated Grand Canyon fine art painters arrived this week to rain, rumble, and rainbows for the 3rd annual Celebration of Arts hosted by the Grand Canyon Association. This popular event features a quick draw competition, art auction, rim side demonstrations, and an exhibit of the artists’ collective work that will run through November 27th in the historic Kolb Studio. “Inspiration” has long been identified by the National Park Service as one in a handful of parkwide interpretive themes—thus elbowing in on the hard sciences and cultural history for making Grand Canyon both unique and worthy of protection. 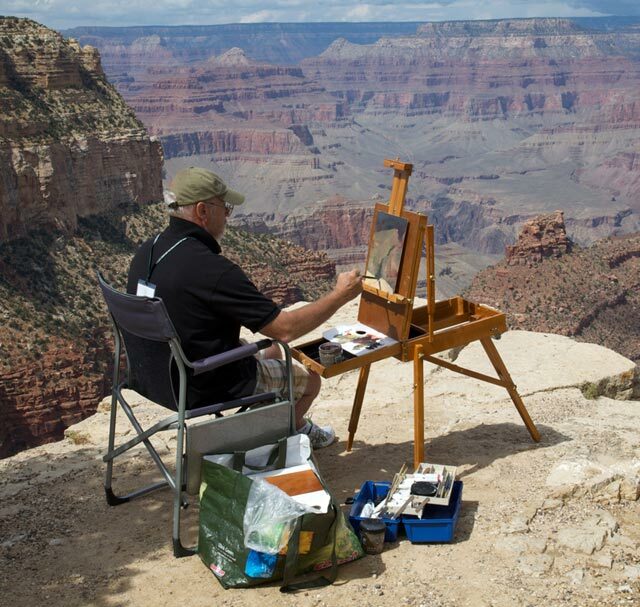 I can think of no greater way to showcase the park’s inspirational qualities than to admire the strokes and dabs of the creative souls that have captured the canyon on canvas for this event.